You'll visit kid-friendly attractions like KidZania Delhi NCR and Sai Ka Angan Temple. The adventure continues: admire the natural beauty at Humayun's Tomb, admire the landmark architecture of Qutub Minar, contemplate in the serene atmosphere at Akshardham, and identify plant and animal life at Jahanpanah City Forest. 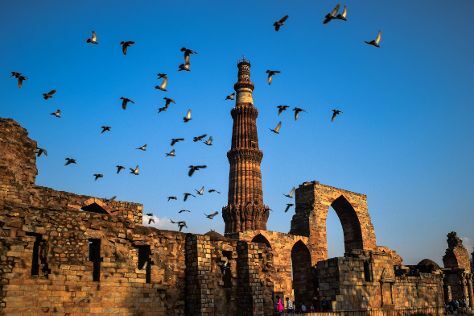 For maps, photos, other places to visit, and more tourist information, go to the New Delhi visit planning tool . The Route module shows you all the different ways you can get to New Delhi. In October, plan for daily highs up to 39°C, and evening lows to 24°C. Cap off your sightseeing on the 10th (Wed) early enough to travel to Amritsar. On the 11th (Thu), don't miss a visit to Gobindgarh Fort, admire the natural beauty at Jallianwala Bagh, then make a trip to Harmandir Sahib, and finally take in the spiritual surroundings of Golden Temple - Sri Harmandir Sahib. To see where to stay, more things to do, ratings, and tourist information, read our Amritsar trip planner . Getting from New Delhi to Amritsar by flight takes about 3 hours. Other options: drive; or take a train. In October, plan for daily highs up to 37°C, and evening lows to 21°C. Finish your sightseeing early on the 11th (Thu) so you can travel to Katra. Kick off your visit on the 12th (Fri): make a trip to Baba Dhansar, contemplate in the serene atmosphere at Deva Mayi Maa Temple, then make a trip to Agar Jitoo, and finally take in the spiritual surroundings of Nau Devi Temple. For traveler tips, ratings, where to stay, and more tourist information, read Katra trip planning website . Drive from Amritsar to Katra in 5.5 hours. Cap off your sightseeing on the 12th (Fri) early enough to travel back home.